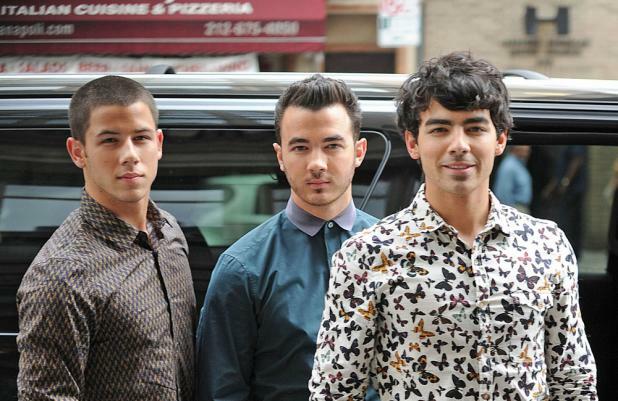 The Jonas Brothers are releasing their new single 'Pom Poms' this spring. The American trio have already filmed the music video for the newly-announced track in New Orleans, where 'On Air With Ryan Seacrest' reports the brothers reigned in the help of two cheerleading teams and a marching band from Southern University. Eldest brother Kevin, 25, announced last week the group have finally completed their fifth studio album and will be releasing the record later this year. He said: "We wanted to take a little extra time on it to make sure it was right, and we've been working for almost a year now on it and it's time and now we're back on the road." Kevin and his brothers - Joe and Nick - are playing shows in Latin and South America at the end of March and are bringing their brother-in-law Mikey Deleasa along for the journey as their opening act. Nick previously said the lyrics on the upcoming album, which they wrote and produced a majority of, are much "deeper" than their earlier work and feels the group have "grown" over the years. He said: "The vibe right now that we're trying to create, we've kind of had a really memorable and a career we're really thankful for up until this time, [and now we're] hoping to create an experience for our fans that is really personal and shows a little bit deeper look into what our lives have been like, as far as lyrics. But, musically we're trying to push ourselves and continue to grow and get better. "We're talking about some really real subjects and things that are meaningful to us both in the present time, in the past, and it's just now out there for people to hear."